Supply Chain of the Future: Humans Optional? As science and technology continue their rapid advance, traditional constructs are challenged; Supply chains are no exception. Here is a brief video that highlights many of the advances that transform how we think about supply chains in the future. As it wraps up, a curated set of videos that touch on several of these advances is provided. Special thanks to Bill Quinn, Rose Castellon-Rodriguez, and Kevin Mulcahy for producing the video. Be sure to visit the Reimagining the Future YouTube Channel to explore additional topics. In a Post from 2014, I explored the path of automation and a possible economic impact between $14 and $30 trillion. Almost four years later, my focus has shifted from economic to societal impact. How far will we take automation? Will automation augment us, freeing us from mundane and redundant tasks, or will it replace us? Is automation limited to those characteristics we typically associate with our left brain – or will it encroach upon our right brain characteristics? These questions currently have no answer – just speculation. How far the slider in the visual below goes, drives a profound difference in the ultimate implications to society. The obvious area of impact is the future of work – if we do indeed realize decentralized autonomous organizations. Do our right brain characteristics become much more important in this future world, and do they represent a safe haven? I show three very impactful examples in presentations that would have us question whether or not machines can be creative, compassionate, and eventual companions. Today on Coffee Break with Game Changers, Bonnie D. Graham hosted a show focused on the future of energy. You can listen to the rebroadcast here. The session abstract is included below, as well as a Twitter stream that provides insight into the topic and our discussion. The show participants included: Bonnie, Gray Scott, Tom Franklin, and myself. You can take a deeper dive on the topic via this Discussion with David Cohen. The Energy Internet is positioned to transform our lives – perhaps on a larger scale than the Internet before it. This dynamic, distributed, and multi-participant Enernet – as some are calling it – is built around clean energy generation, storage and delivery. With a long list of innovators emerging, the resulting innovation will drive massive change, including how we think about cities, municipal services, transportation, insurance, real estate, financial services, and more. 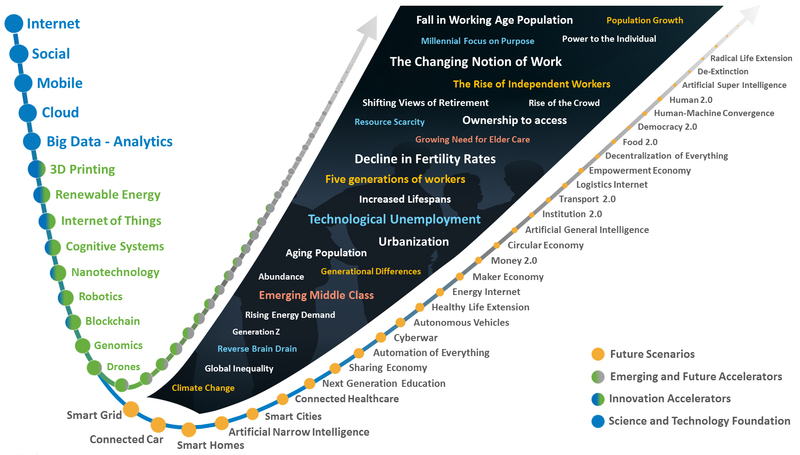 I’ve been talking lately about the two main tipping points in human history: from hunter-gatherer to agriculture, and agriculture to our industrial society. That second tipping point beginning about 1760 ushered in three revolutions. The First Industrial Revolution saw the rise of iron and textile industries and the mechanization of production through the use of water and the steam engine. This second tipping point saw a reduction in physical labor and a shift in where new forms of labor were required. The Second Industrial Revolution started in 1870, riding advances such as electricity, telephone and the internal combustion engine to drive rapid industrialization and globalization. A massive disruption followed, as established sectors were eliminated and new ones emerged. In his eight post in the series, Marshall Kirkpatrick focuses on the intersection between artificial intelligence and blockchain. By way of reminder, Marshall launched a 30 day series that explores the intersection between AI and the various innovation components on my emerging futures visual. In his third post in the series, Marshall Kirkpatrick focuses on the intersection between artificial intelligence and Fintech. By way of reminder, Marshall launched a 30 day series that explores the intersection between AI and various future scenarios anchored by my emerging futures visual.